We are eight weeks into the 2018 season, which means it’s time for some midseason awards. Let’s get right to it with PFF’s All-Pro team at the halfway point of the 2018 NFL season. The Saints QB is simply not missing throws. On his 254 dropbacks, he’s been downgraded only 23 times. One can see how much of an outlier that is when compared to other MVP candidates like Patrick Mahomes (33) and Jared Goff (38). Unsurprisingly, his 84.8 adjusted completion percentage would be far and away a PFF single-season record. Hunt had a bit of a slow start, but over the past handful of weeks, no one has been close to the Chiefs back. His 33 broken tackles on 134 carries are the most in the NFL, and his 88.2 elusive rating ranks second to Steelers running back James Conner. Thielen’s consistency is reaching rarified air at this point. Six of his eight games so far have received grades of 80.0 or higher with two eclipsing 90.0. His 95 targets are eight more than any other receiver in the NFL, and even at such a high rate, Kirk Cousins has a passer rating of 123.9 when throwing Thielen’s way. 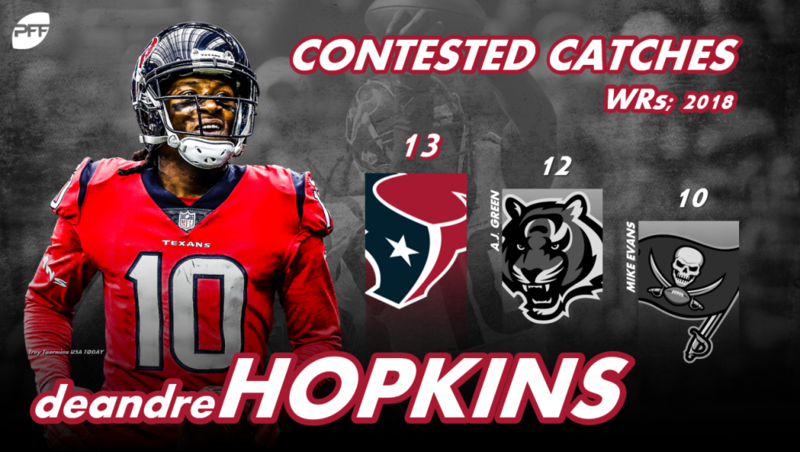 Not only does Hopkins belong here statistically, but his highlight reel is also at an All-Pro level this season. He’s made 14 contested catches – the most in the NFL – on only 23 attempts, and his one-handed grab against Miami (that, unfortunately, didn’t count) was easily the catch of the season. There has been no more complete tight end in the NFL this season than Kittle. Travis Kelce and Zach Ertz may have more yards, but neither hold a candle to Kittle as a blocker. The 49ers tight end is ranked fourth at the position in receiving and run blocking. There’s no more dangerous deep threat in the NFL today, and it’s not up for debate. Hill’s 309 deep receiving yards are the second-most in the league, and he’d be on top if not for an end zone drop against the Bengals. Bakhtiari is the preeminent pass-protecting tackle in the NFL today. His 94.3 pass-block grade is far and away tops in the league. On 349 snaps in pass-pro, Bakhtiari has allowed only one sack, one hit and seven hurries. Listed at 6-5, 323 pounds, Saffold has always been a people mover, and that’s no different this season. He’s earned the top run-block grade among all guards. No guard in the NFL has more positively graded blocks than Saffolrd’s 38. Yet another All-Pro nod for Kelce, who is still at the top of his game. Once a player known as a liability in pass protection, Kelce has allowed only five pressures all season long and has the third-highest pass-block grade at the position. The Rams’ offensive line somehow has gotten better from a season ago, and this man is the biggest catalyst behind that. The third-year guard that the Rams got for nothing after he was waived by the Colts last year has been a revelation. His 72.9 run-block grade ranks fifth among all guards while his 84.5 pass-blocking grade is eighth. Other right tackles have higher grades in pass protection, but Ramczyk’s 83.3 run-block grade – the second-highest among all tackles – gives him the edge. Oh, and he’s also only allowed four pressures all season long in pass protection. We’ve no clue what lightswitch flipped inside Dee Ford, but we’re not complaining about it. Ford’s speed rush has been a terror for right tackles this season, as he’s racked up 19 combined sacks and hits in the process – the most in the NFL. The sack total may not be where it was a season ago, but that’s been Graham’s MO his entire career. The Eagles defensive end is the best bull-rusher in the NFL and, as such, effects far more throws than raw sack totals would suggest. His 12.0 pass-rush productivity is ninth among edge defenders while his 14.3 run-stop percentage ranks sixth. Watch Donald for more than a few plays, and it’s painfully obvious that he’s in a level all on his own. He not only leads the league in sacks with 10 but also in total pressures with 54. To do that from exclusively between the tackles is something we’ve never seen before. Some guys get $100 million deals and mail it in, while others get $100 million deals and take their play to the next level. Cox falls in the latter. The Eagles defensive tackle has taken over the throne from Geno Atkins as the best bull-rusher interior defender in the league. It’s a big part of the reason why he leads all defenders with 14 QB hits on the year. Wagner’s tackling ability has reached all-time great status at this point. He hasn’t missed a single one on 42 attempts this season. 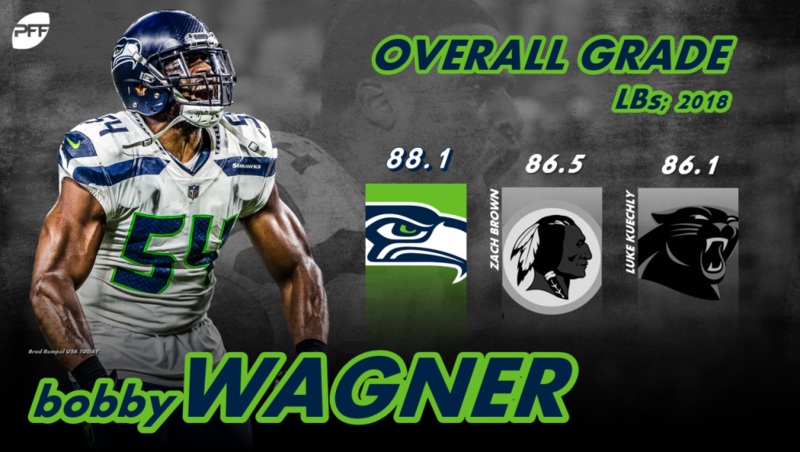 If we keep going back over the past year and a half, Wagner has missed all of three tackles on his last 192 attempts. And all three of those came after he returned from an injury late last season. It hasn’t been a banner year for Kuechly so far, but even Kuechly’s ‘meh’ is still better than anyone else in the league. His 14 coverage stops are the second-most of any linebacker in the league, and he’s only allowed 10 first downs on 28 targets this season. Jones’ transition to cornerback has gone far smoother than anyone outside of maybe Jones himself could have imagined. Through seven games, he’s allowing under two catches and only 20 yards per game. He’s also yet to allow a touchdown. Those numbers are out of this world. 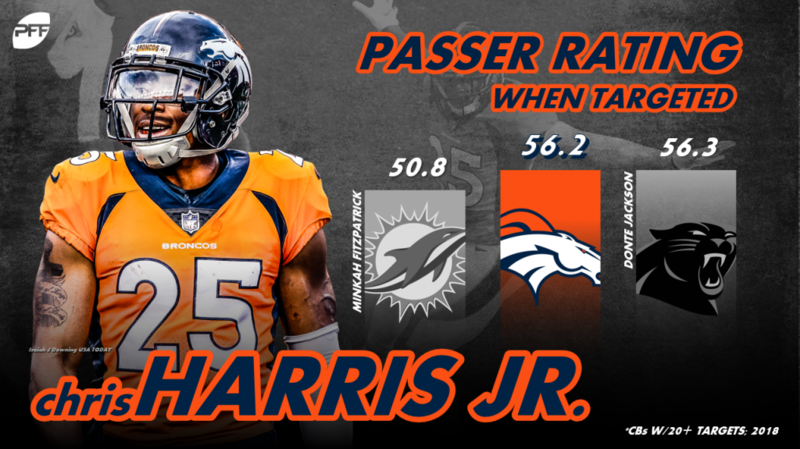 Harris continues to play at a high level even if the pieces around him have dwindled in recent years. His 12 coverage stops are the second-most of any corner in the league, and he’s missed only three tackles in coverage on 30 attempts. Harris’ .47 yards per coverage snap from the slot also lead the league. There isn’t much Swearinger hasn’t done at a high level this season. His four picks are the most of any safety in the league while his seven coverage stops rank sixth at the position. Swearinger is also the fourth highest-graded safety in run defense at 78.4. Bates hasn’t looked anything like a rookie through the first half of the season in Cincinnati. The Bengals safety has allowed all of 59 yards into his coverage on 16 targets so far this year and has three picks to boot. Jackson has been the definition of a flex player through the Texans first eight games. He’s taken 225 snaps as a boundary corner, 114 as a slot corner, 129 as a deep safety and 75 as a box safety/linebacker. And it all depends on where they need him that game, as just two weeks ago he took 64 of his 68 snaps at only right corner. Lambo has attempted 12 field goals and 12 extra points this season, connecting on all 24 of his kicks. Good from distance, he is tied for second in the league with three field goals of 50-plus yards, including a 57-yarder at Wembley Stadium this past Sunday. Palardy has been fantastic for the Panthers this season, with 18 of his 28 punts landing inside the opposing 20-yard line. 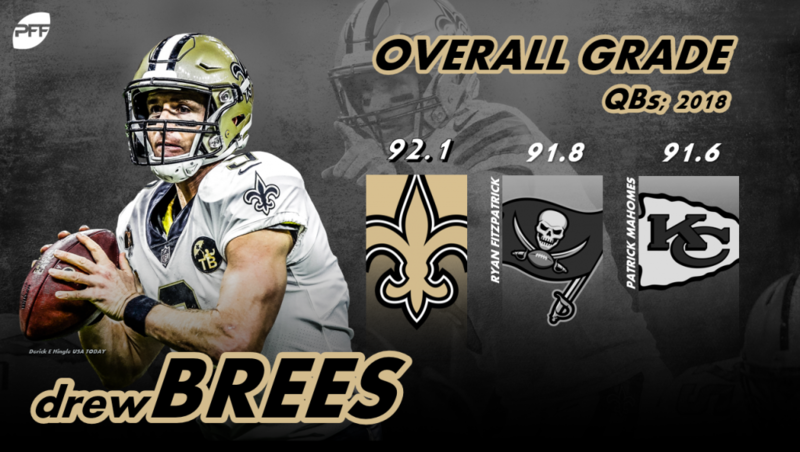 He is the only punter through the first eight weeks of the season to produce a PFF grade of 80.0 or above and has routinely showcased his ability to pin returners close to the sideline to limit return opportunities. Littleton has only played 57 snaps so far this season, but he has made a huge impact on special teams, with two blocked punts through the first eight weeks of the season, making the type of impact plays that have helped the Rams navigate the first half of the season undefeated. Roberts has averaged 18.1 yards per punt return, the highest average among players to return at least 10 punts this season. He has found the end zone once, accumulated 399 kick-return yards and produced a long of 78 and 53 yards on punt returns and kick returns, respectively.